The Wilderness Systems Ride 115 Kayak has big-time stability and versatility in a small-time kayak. The Ride series has everything paddlers, anglers and hobbyists ask for in a sit-on-top. Massive capacity, straightforward storage, versatile performance, and rock-solid stability. At under 12-feet, there is not a more portable powerhouse on the market. Features AirPro Freedom Elite Low seating system for comfort and easy adjustability. Features include performance oriented hull, large rear tank well, bow and mid-ship Orbix hatches, stand-assist strap, and the SlideTrax tool-less outfitting system. First let me say I did not buy my Ride from ACK but the next boat I buy, I will. I purchased my Ride 115 primarily for fishing and crabbing. I live near the Chesapeake Bay and there are a ton of different opportunities and conditions to use it. Ranging from open water to tidal marshes and creeks so far I am extremely happy with it. Stability of this boat is exceptional I can stand in it and sit sideways. The boat tracks well and maneuvers exceptionally well It's not going to set any speed records but you don't buy a 11.5 ft. boat for that. I have used the low seat that this yak came with and it is comfortable with a lot of adjustability. I like the molded in groove for paddle storage. It allows me to store the paddle out of the way when I'm fighting or landing fish without any aftermarket paddle clips sticking up to snag lines etc. Adjustable foot rests are great to change position to give you legs a break. The boat is somewhat heavy but its generally not an issue. This thing can handle a lot of gear and never puts your seat in the water. I purchased scupper plugs to try to stay dry when the water is cold but I've never had to use them. The rear tank well has excellent room for a classic milk crate set up or crab traps with room to spare. I have done some rigging on my boat fish finder rod holders etc. It might not be the ultimate big water boat but if your fishing lakes, back bays, creeks and ponds its an excellent piece. I did buy the Air Pro MAX seat (That I did but from ACK) Mainly cause I have back issues and it enable me to stay on the water longer and enables me to sit up higher for sight fishing if I wish. I am a devoted fan of wilderness system boats I have a Pungo 140 and my wife has a Pungo 120 and we use these for recreational paddling. The customer service provided by ACK was outstanding when I purchase my Ride 115. The original color that I purchased was unfortunately unavailable and the quick phone call from customer service team member helped me choose a different color pattern and make things right on their end. I was a little nervous about purchasing such a large item online but the shipping was fast and on time and the attention of the packaging of my new Ride was very professional and delivered undamaged. 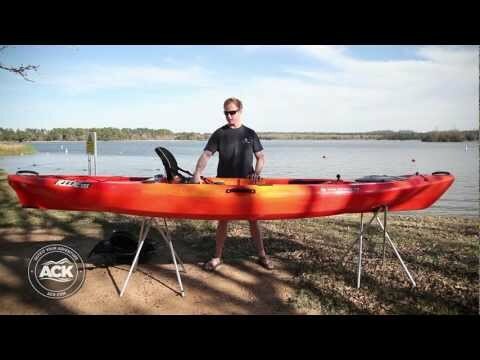 I would and will recommend ACK to anyone wanting to purchase a kayak. As for my new Ride, it is very solid and very well built and I'm happy with the alternate color pattern from the original that I considered. I'm Just waiting for this Northeastern weather to cooperate for its maiden voyage. I am super impressed with the stability of my new Ride 115. I've only had it out a few times since receiving it a couple weeks ago but I'm loving it and look forward to every chance I have to get out on it. The layout is good with the center hatch keeping smaller items I need easily within reach and dry. The seat is quite comfortable and I appreciate the many ways to adjust it to fit me. My only complaint about the seat would be that the back doesn't adjust vertically like on the Tarpons that I've seen. ACK can't be beat on price or service either! The kayak was wrapped very well and arrived much quicker than I expected. I LOVE my new Kayak. I was looking and wanting something that would 1). Being a larger woman, I needed a seating area big enough--I'm 5.4&quot; and 250lbs. 2). I wanted something stable so not to feel like I was going to tip over easily. 3). Something I could also use for fishing. 4). Lots of storage and room for bringing anything I wanted. 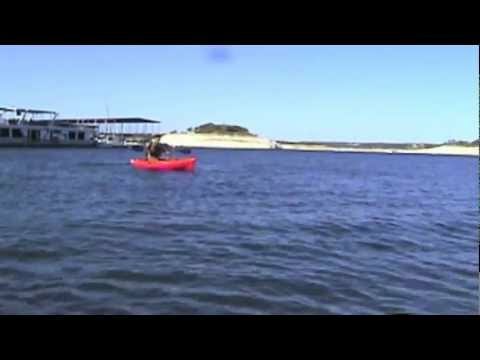 This is THE kayak! It meets all my needs. Paddling is simple although it's probably a little slower going than the much sleeker kayaks out there but not much. The only downfall is because of all the above, its a little heavier than I would like but it is very manageable to carry with two people or dragging by myself across the beach. LOVE, LOVE, LOVE it!